Make It: The Reverse Sear Steak | Valet. 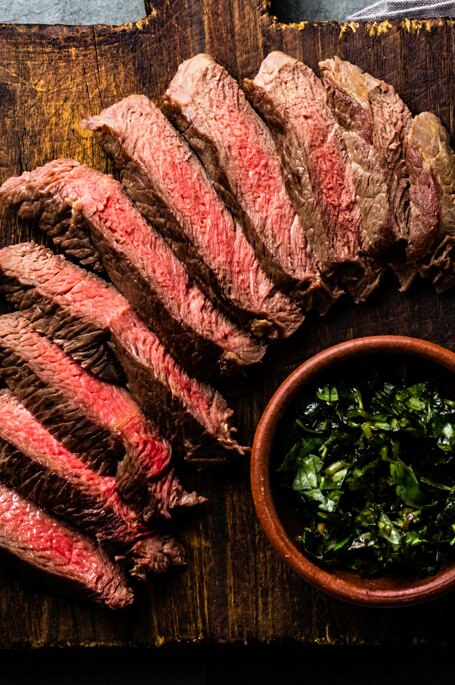 A Crazy Simple Kitchen Hack That Results In a Steakhouse Quality Meal Every Time. Short of slicing off part of your thumb, there are few worse kitchen disasters than ruining a perfectly good piece of meat. You hand over your hard-earned money for a quality cut, cook it with the best intentions and a trusted recipe. But when you cut into it, you're confronted with a dry, tough, grey-ish slab that can't be saved by even the best steak sauce. Thankfully, there's a way to cook steak at home that delivers steakhouse quality results every time. It's called the reverse sear and it's deceptively simple. It starts by roasting the steaks on a low heat to get the desired doneness, then searing it on a hot grill or skillet to achieve that deliciously crisp, smokey crust. This low-and-slow method flips the script of traditional steak prep and removes the guesswork, ensuring a tender and juicy center cooked just the way you like it. And it's not just for amateur cooks either. "I prefer the reverse sear method for just about all my steaks," says grill master Kevin Ward of Atlanta's Four 41 South BBQ Co. "It produces a consistent doneness from one edge of the steak to the other, while creating an amazing crust and caramelization on the outside." You see, when you cook the steaks in the oven first, it slightly dries out the meat's exterior, allowing for a much better sear on the outside. Sure, this method requires a meat thermometer, but it's an affordable tool that will continue to prove its worth. Other than that, all you need is some salt and pepper—because steaks this good require little else. Now get cooking. Place your steaks on a rimmed baking sheet fitted with a rack. Season generously with salt and pepper. Roast in the oven for 40 minutes to 1 hour, until an instant-read thermometer reads 125°F for medium rare, 135°F for medium. Take the steaks out and let them rest for five minutes, while heating up your grill or cast iron skillet. Once your cast iron skillet or grill is extremely hot, add a tablespoon of oil and sear steaks one to two minutes per side, until a dark brown crust forms. Let rest another five minutes under foil, then slice and serve. Ward suggests searing your steaks in bacon grease to add a subtle depth of flavor to your steaks. "Always drain the grease off into a mason jar when cooking up bacon and place in the fridge. It always comes in handy." New ways to enjoy this swanky Italian cocktail. A simple, three-ingredient drink that's ideal for a date ... or just yourself.